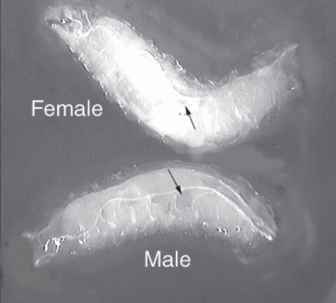 Preparation of chromosomes from various species and tissues is broadly the same: tissues are dissected from appropriate staged animals and generally fixed in an organic acid fixative. The preferred fixative for Drosophila salivary gland chromosomes is 45% acetic acid, followed by 1 : 2 : 3 lactic acid : water : acetic acid. The choice of fixative is not immutable, however; for example, many drosophilists use merely 45% acetic acid. Use only slides with good quality chromosomes. These appear flat and gray, with clear banding. Chromosomes that appear bright and reflective under dry-phase examination will have poorer morphology, hindering accurate interpretation (see Note 4). The region of the slide where the chromosomes are located should be visible when the slide is dry and it should be marked with a diamond pencil on the reverse side of the slide. Drosophila stocks should be maintained on a medium suitable for the species in use. The best larvae are collected from well-yeasted, uncrowded cultures. Select large third instar larvae that are still crawling and have not everted their anterior spiracles. 1. Dissect out the salivary glands in a drop of 0.7% NaCl and transfer them to a drop of 45% acetic acid. Allow to fix for approx 30 s.
2. Transfer the glands to a drop of 1 : 2 : 3 fixative on a clean siliconized cover slip. Fix for 3 min, then pick up the cover slip with a clean slide, by touching it to the drop. The slide does not have to be coated or "subbed" before use. 3. Spread the chromosomes by tapping the cover slip with a pencil in a circular motion. Check the chromosomes using phase contrast. When the chromosomes are suitably spread, fold the slide in blotting paper and press gently to remove excess fix. Leave the slide at room temperature for 1 h to overnight. This step squashes the chromosomes as the fix evaporates, and the cover slip sinks toward the surface of the slide. Alternatively, the slide can be squashed firmly between blotting paper and frozen immediately. Take care not to allow the cover slip to slide sideways or the chromosomes will be overstretched (see Note 4). 4. Freeze the slide in liquid nitrogen. While the slide is still frozen, flip off the cover slip with a scalpel blade and proceed to step 5. 5. Place the slide in 70% ethanol for 5 min. Transfer the preparation through two 5-min changes of 96% ethanol and air-dry. The chromosomes can be stored desiccated at room temperature.